Hail Varsity’s by-the-numbers approach to previewing the season rolls on with a look at the running back position. That position has been one of the strengths at Nebraska over the years with the likes of Roy Helu, Rex Burkhead and Ameer Abdullah tearing it up. However, over the last few years, the Huskers have struggled to find a difference-making workhorse back. With a few returners rom last year and some talented newcomers in the room together with Scott Frost’s offense, could the running back position once again be a dynamic weapon for the Huskers? Scott Frost’s offense is as explosive as any in the country while Nebraska’s last season was the exact opposite of that. The Huskers averaged less than four runs of 10 or more yards per game last season, which is about half of what the Knights produced at Central Florida. It gets worse when you extend that threshold. Nebraska only produced 10 runs of 20-plus yards, two of 30-plus and one of 40-plus. The Huskers did not rip off a single run of 50 or more yards last season. Conversely, the Knights in Orlando had 22 20-plus-yard runs, 10 of 30-plus, eight of 40-plus, six of 50-plus, five of 60-plus, two of 70-plus and one run of more than 90 yards. Under Frost, Central Florida had the ability to score from anywhere on the field. Nebraska, on the other hand, was one of the least explosive offenses in the Big Ten. That is going to have to change for Frost’s offense to work in Lincoln. An offense isn’t going to produce big runs without quality blocking at the point of attack — and that certainly needs to improve at Nebraska — but at a certain point it’s on the back to find the hole, explode through it and beat the defenders to the end zone. 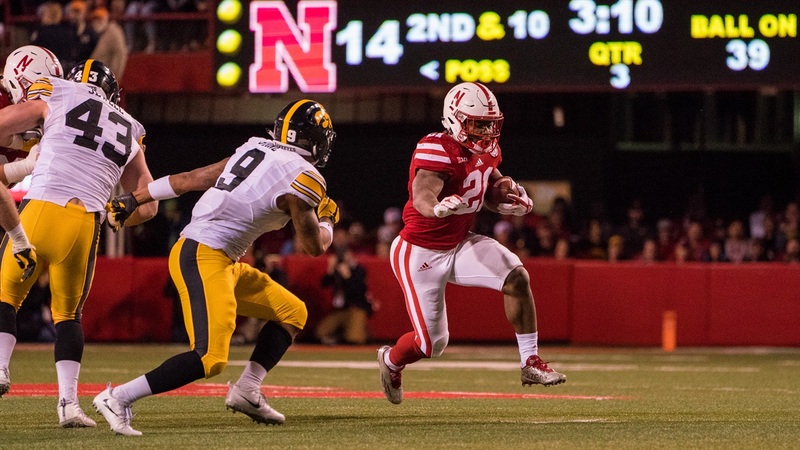 The Huskers have lacked a true home run threat at running back since Roy Helu Jr. As talented as backs like Rex Burkhead and Ameer Abdullah were, they lacked true top-end speed. Perhaps Nebraska has finally found that guy in junior college transfer Greg Bell. There were some positive signs to draw from last year’s running back group. Tre Bryant was very good in his one-and-a-half games (and the Huskers blocked for him better than any other back) and both Mikale Wilbon and Jaylin Bradley did well with what little blocking they got (4.5 and 4.4 highlight yards per opportunity, better than both of their per carry averages). I chose to focus on the running back position as a whole, however, and particularly on one skill that is almost identical between the Huskers and Knights last season — pass catching. Last season, Nebraska’s backs caught 39 of 51 targets (76.5 percent) for 247 yards (6.5 yards per reception). Central Florida’s caught 35 of 46 targets (76.1 percent) for 221 yards (6.3 yards per reception). For this purpose, I excluded the Duck-R position (Otis Anderson) since 2017 Nebraska doesn’t have a clear comparison for that hybrid position. Anderson was Central Florida’s biggest threat out of the backfield, lessening the importance of the true running backs in the passing game, but they still play in important role. For Central Florida, Adrian Killins Jr. was responsible for most of those catches, and he was pretty decent with them, picking up 6.8 yards per catch with a 40.6 success rate. However, Nebraska’s most-targeted back — Wilbon — had far less luck. He racked up just 80 yards on 21 catches with a 25.9 percent success rate. Devine Ozigbo was targeted nine fewer times but was almost twice as successful as Wilbon (7.7 yards per catch, 44.4 percent success rate). Once again, Bell could be a big upgrade for the Huskers in this area with his speed and dynamic ability in the open field.